Everything was perfect and better than expected. Great host! Very professional and always available. Our family had a wonderful time at this Villa. It was beautiful inside(clean) and AC worked great. We felt like we had the beach to ourselves and everyone was super friendly. Lucky enough to have beach stuff in the villa for our kiddo as well. Also we forgot our hats so having that there was just such a nice touch. Thank you for a memorable vacation. Great hacienda for a week long stay in Puerto Rico! Lovely and spacious with areas to accommodate everyone’s vacation choices. Nice pools and great access to beautiful and mostly empty beach. The covered patio with hammock and constant breezes was this mom’s favorite perch. Kitchen is well equipped, nice bedrooms and bathrooms and plenty of towels for bathing and beach. Our two families had a lovely time staying at Villa Blue Sea in the Costa Dorada community of Dorodo, PR. (4 adults, 3 pre-school aged kids, one baby). The two levels of the unit have massive picture window/doors that open completely from the entire communal space (kitchen/dining/living room) out to a wonderful covered patio, and two of the three upstairs bedroom that have the most beautiful and direct view of the waves and ocean. We enjoyed this open, light-filled and breezy space and the lovely sounds that go with it so much!! Only used the AC at night despite hot weather, because the ocean breeze and ceiling fans moved the perfect amount of air through the house. The property has direct beach access to a small and lovely beach, and well as a pool with kids pool on the grounds. Rinse off showers are included at both. There is a big grill on the porch and lots of seating. Beds were comfortable and and sufficient linens provided. Alma and her team were very response to our requests and during the welcome walk-through. Would come back in an instant!! Steven, Maureen and I had a wonderful stay. Villa Bella Mar was the perfect villa for us. Starting with the spectacular view. It was the ultimate place for calm, quiet and stress free days. It was a great home base for other activities we did around the island. We will definitely keep this villa in mind for our next visit. . A Thank You to Alex for all his help. He was great, responding quickly to our questions. A shout out to Alma for making the whole rental process a breeze. Thank you. This was our third visit to Puerto Rico and our first to Lakeside Villas in Dorado. We absolutely loved everything about Villa Iris, including the beautiful artwork. Alma was very easy to work with and if we had questions or needed anything she immediately replied. The villa was very comfortable and had everything we needed for our 10 day stay. It had one of the best views of our incredible private beach. Dorado was a great location and we could get to most anywhere we wanted to go within 30 minutes. El Ojo del Buey Park was a hidden gem just down the road to the east. We went to Arecibo, which was about 30 minutes west, and visited Cueva Ventana (Window Cave), Chorros del Rio Hondo (a beautiful waterfall), and the Arecibo lighthouse, which had the most incredible views and bluest water. We ate at Arreciff 681 in Arecibo, which is a very cool beach bar with incredible food. The Bacardi Distillery is also worth a visit, along with a ferry ride to Old San Juan. There were so many great places to eat in Old San Juan, but two favorites were Ostra Cosa and La Garita. The adrenaline junkies went ziplining at Toro Verde Nature Adventure Park. We hiked El Yunque twice and it was just as spectacular as we remember. There was only one trail that was closed but everything else was open all the way to the top. Puerto Rico is back baby!! Alma’s villa exceeded the expectations of myself and my other seven traveling companions. We were very pleased with the accommodations (comfortable beds, ample linens, outfitted kitchen) and the cleanliness of the villa and grounds. We had the beach to ourselves the majority of our stay and there were always lounge chairs available at the pools. The gated entry made us feel safe and we felt comfortable walking around the grounds in the evenings. Per Alma’s recommendation, we were able to take advantage of the local grocery store (Amigo) and a little roadside bar we found on the way to Paradise Villas. She also provided us the name of a local tour guide who brought us to a cave and some waterfalls in the rain forest, at what we agreed was a very reasonable price. The distance from San Juan was perfect. We felt as though we were at a secluded resort, but we were only a 30 minute drive to the city. (I would highly recommend renting a car!) Honestly, there’s nothing I would change. Thanks, Alma! This villa was GREAT and excellent value – the villa is MUCH nicer than even the photos show. Pleasantly surprised. Very spacious and fully equipped with everything we needed for our stay. Beds were super comfy with fresh linen- smart TV in the living room with leather couches – wifi strong – Alma and Alex were amazing – they had a gift bag for us upon arrival with lots of essentials and gave us tons of tips about the island. The villa is in gated community right on the beach and we could walk out from our patio to the beach or pool in minutes. Loved the breezes on patio and the large BBQ. Definitely coming back to Villa Giovanni. Alma was amazing. Helpful from beginning to end. She helped us plan the trip and helped us with all sorts of things when we were there. I really like the house we stayed in. I would definitely go back. We had a great time at this rental. The home was lovely. It was great to spend our mornings on the patio outside with the chairs and hammock. The beds were comfy – and the home had everything you would expect from a beach house. Lots of good beaches near the home. It was a good base for us to explore Northwest PR. Highly recommend. We had a wonderful holiday at Alma’s villa. The place is very spacious with huge bedrooms and a nice living area with a big TV with premium channels. Nice outdoor area with a hammock as well. Pools on the property are very nice and well maintained. The beach is a very short walk away and it is beautiful and was not at all crowded. Great time had by all! I moved to another villa (Gardenia) due to accessibility issues for my 90 year old mom. The new villa was all one floor and larger with 3BR and 3baths. The villa was gorgeous – clean, extremely comfortable and had plenty of everything you would need for a stay. Everyone in my party loved the place, the location and the private beach! Alex, the Guest Services Manager, was very friendly and responsive. I’m sure he gets the same questions from guests over and over again but he always responded in a kind and caring way. Alma was extremely pleasant to work with! She thought about all of my guests and asked questions to ensure everyone would be comfortable in the villa. She responds quickly to emails and is very detailed in her responses. Overall, everything was wonderful and I would definitely stay again on my next trip! Firstly, the Location was exactly where we wanted to be, since it was right on the Dorado Ritz property. The house had many amenities, one of my favorites was the golf cart, which I used daily to explore the property. Secondly the house was very comfortable, and I loved the kitchen, and every time I had a question, I had a number to call, and the helper was just fantastic. (the helper picked up groceries for me and was available on the phone any time (6am or 12midnight) that I needed him). I had such a great time. I will absolutely be coming back. I do not know how to begin to describe my experience with Alma. When I contacted her about a rental – I had been having a difficult time. But, even though we did not know one another, Alma was very sensitive to our situation and took care of things very quickly. Within a few hours Alma found us an excellent place – Villa Gardenia – which turned out to be a home-from-home for our family. It’s located in a real paradise – including ocean views and access to a private beach. The villa is full of books and, among other things, my family and I were able to enjoy a lot of reading. Security is excellent, and their personnel were very kind. Our stay in the villa coincided with the passage of a hurricane which hit the island. Alma sent employees to secure the property and to make sure we felt safe. Finally, throughout our stay, Alex was always cheerfully ready, willing and able to help with anything that was necessary. What else could I add to this review? I know there’s more but let me finish by saying I plan on returning with my family to once again enjoy this WONDERFUL EXPERIENCE. A beautiful piece of paradise. Modern, clean with an open layout. This villa was the perfect compliment to the breathtaking view outside. The real showstopper is the scene from the balconies especially at sunset. All the necessary amenities were included, even relaxing beach chairs. A tropical home away from home! We would love to come back again and will suggest this rental to everyone! We stayed at the Villa Blue Sea in July 2017. My husband and I, my son and daughter and her boyfriend. What a beautiful condo! Just loved it – the view of the ocean, waking up in the morning and hearing the ocean waves. Must say, I was very sad to leave the area. I will recommend the Villa Blue Sea to all my friends. For those looking for a worry-free vacation with all the comforts of home ( and perhaps even better), Vila Ileana is the place to be! Perfectly appointed with comfortable and stylish furnishings, and equipped with all the gadgets for a comfortable stay. The bedrooms are spacious and clean, light bright and airy. Dine on the patio or enjoy your cafe on the expansive veranda. This was our second visit, and it appears to be our annual visit. The staff is accommodating and full of useful tips and information. The location is private and secure. There are no worries at Villa Ileana. Just bring your bathing suits! Alma’s staff was a pleasure to work with. They made the process of checking in seamless and made sure we were very well taken care of for the entire trip. The place was a great value and location is unbeatable. Beautiful. Clean. Perfect. Nearby restaurants, grocery store, beaches. Highly highly recommend. Villa Ileana at Lakeside Villas is the best ever! This property is so relaxing and beautiful, I wouldn’t have it any other way. Alma and Alex are the BEST. I would recommend this place to everyone I know. It’s good, clean and hospitable – with everything in the Villa that you need or want. There are the Beaches, Salsa Dancing, Caving, Bacardi Rum Tours, Rain Forest and much, much more! We wanted to stay extra days. We’ll be back again and will stay at the same Villa Ileana at Lakeside Villas. Do not forget to ask for Alex – we loved him. He’ll answer every question you need to be answered. I would rate this as 6 stars. The condo was very nice, including furnishings, good beds and linens., and we loved the huge porch ! The complex had great grounds and the pools were lovely! Good restaurants in Dorado, plus lovely beaches nearby! Alma and Alex were awesome assisting us! We would definitely stay here again! My family and I had the most amazing time at the villa. Everything was super clean and the floorplan was a great layout. There wasn’t AC in the living area, but it was no problem because it was such an open floorplan, you just opened all the windows and doors and got the greatest ocean breeze that kept you cool. The back bedrooms stayed super cold with awesome AC and the beds were super comfy. The only thing was it can get noisy at night but that’s PR and we were there over 4th of July so noise is expected. The downstairs neighbors were super nice and friendly too. There was such great communication with Alma & Alex and checking in and out was a breeze. They really made it so simple and provided such great detail, I never worried about a thing. I think my family found there new annual summer beach rental – we will definitely be back next year! Villa Gardenia – Perfect villa to relax and have a blast! It’s my second time choosing to stay at Villa Gardenia! I love this beautiful, extra spacious, comfortable house steps from the most amazing beach spot in Dorado. The beach is almost completely private! This villa is immaculately clean and beautifully decorated. It’s the perfect place to relax, entertain and play at the beach! You won’t need to bring anything. My boys had a blast running the ways on the boogie boards, playing in the gorgeous sand and loving every minute of it. I love to sit in the terrace outside with a good book while the boys enjoyed the facilities inside this safe, quiet and friendly community of villas. The location works out great too as Dorado has many nice restaurants, supermarkets and stores to visit. Plus the easy access to San Juan makes it perfect for me to visit relatives and have them come visit us. I cannot say enough what an amazing spot this. Our stay was phenomenal. The pictures were exactly as described and there was a beach right beside us. The house was clean and the fact that it came with a laundry machine was great! The host was very attentive and whenever we needed anything they would immediately do whatever they could to assure that we had a lovely stay! Will definitely go back in the future! We stayed for a week in the villa – two adults and three teenage girls. My daughters loved the place. It was spacious – 4 bedrooms, a big living room, dining area and a well-stocked kitchen, plus three bathrooms – and well-appointed, precisely as described in the advertisement. The inside and outside space were immaculate on arrival and we used both generously during the week. Nice backyard patio table – perfect for breakfast! The villa was also conveniently located – about a 30 minute drive to Old San Juan. The liaison, Alex, was helpful on our arrival and responsive to our needs during the week. The entire complex was well-run. 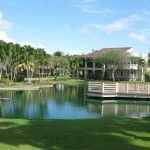 It is a very safe, well-maintained gated community with a pool and access to the ocean. “My wife and I were looking for a nice place to celebrate our anniversary this summer. We wanted a place near the beach, near all of the popular sites but away from the mainstream traffic, and large enough to accommodate our entire family. Dorado Reef checked all of the boxes and more… From the beginning, Alma was very helpful in making sure the accommodations met all of our needs. She was always responsive and seemed genuinely concerned with making sure our stay was a good one. Once the arrangements were made, it was time to take our trip. I expected a nice villa in a well-maintained community but what we saw more than exceeded my expectations. The villa was absolutely beautiful and the grounds were so well planned and maintained, I can see myself spending a full vacation there without ever leaving the villa. We arrived and met with Alex who showed us around the villa and the grounds. Alex was also very accommodating. He was always happy to help us find what we needed and even made a few phone calls to help set up reservations for us. He went above and beyond to make sure our stay went well. The villa was clean and well furnished throughout. The beach was a short 5-minute walk or an easy 2-minute drive away. (A golf cart is provided.) We were there for eight days and in the end, it really wasn’t enough. “The villa is very spacious and immaculately clean. There is a large atrium with very pleasant acoustics. The air conditioning system is divided into zones to spare the owners from the ridiculous electrical rates on the island, but is very powerful and provides immediate relief when breezes through the house are not sufficient. The immediate surroundings are lovely. The patio overlooks a pond with interesting black-and-white ducks, a tree where small black birds with unusual calls roost, and a pool. I opted for the nearby beach, within a 5-minute walk, over the pool. Along the walk are little crabs that dart in and out of holes near the path, more unusual tropical birds, and, after dark, mesmerizing sounds of birds and tree frogs from the adjacent forest. Behind this beach is a small open-air restaurant for when you’d prefer a 10-minute walk along the beach to cooking or driving anywhere. I felt very safe in this community, security is very tight and the surrounding fence is not something anyone would want to climb. I even got a knock on the door from an observant security guard who noticed that I had left the dome light on my rental car on. The owner, Alma, provides a detailed welcome letter with information about the villa, local area, and PR in general, and there are more detailed resources in the villa, including a notebook with laminated sheets for various day trips (e.g. Camuy Caverns + Arecibo, El Yunque + Luquillo + Fajardo). The local manager, Alex, shows you around the villa when you arrive, answers any questions you have, and is always on call to help. I only needed basic shopping advice and directions to a nice local body surfing beach I’d heard about, but I had the feeling that if I’d had engine trouble up in the mountains somewhere, Alex would have bailed me out. The island itself is magical. My two highlights were the sights and sounds of El Yunque rain forest, and the enormous Arecibo radio telescope. Both had me slack-jawed in amazement . “House perfect. Incredibly spacious and beautifully furnished, yet kid friendly. We were six, three generations. Breakfast on the patio, perhaps a rest in the hammock or swing chair. No! We’ll save that for later; everyone into the pool, 20 strides away. Good morning ducks. Yes, it’s another perfect day in Paradise. Great and spacious base camp for PR adventure – Excellent base camp for 7 of us on a week-long trip to PR. Close to beach, convenient location, very spacious, let us relax, do our own cooking, highly secure. Manager extremely nice and accommodating. Would definitely choose this again! Review #5855257 Fantastic Vacation Retreat! When the temperature is 14 below zero at home, ANY PLACE warm would seem ideal, but we hit the jackpot. Our two weeks plus two days (we were stranded 48 hours because of bad weather stateside) was a delightful taste of paradise. Alma’s three bedroom villa is nicely appointed, the beds are very comfortable, and having a separate bathrooms for each bedroom is definitely a plus! The location is ideal, just minutes from Dorado and some terrific restaurants, very close to beautiful golf courses, and grocery stores also close by. The villa community is completely gated, so we always felt safe. Alma’s property has a premier location. Her patio faces a lovely lagoon and is literally steps from the pool. The beach, a five minute trek, is absolutely beautiful- sandy bottom, fun waves, delightful in every way. The water was close to 80 degrees –like velvet!! The villa was great. My friends wowed when walking into the spacious and nicely decorated property. The manager and the cleaning lady were both responsive and helpful. Our stay was very much enjoyed, especially by the kids. “I want to heartily recommend Alma Bair’s Beach Villa house if you are looking at renting a place in Puerto Rico. I did an extensive search of homes that would accommodate my family for a Puerto Rican vacation. I contacted 50 different available places and narrowed my selection down to five. I then made a trip to Puerto Rico to check out each of the rental homes. By far, Alma’s property stood head and shoulders above the rest of the places that I saw. Let me tell you why I say this. First, the house is located in the beautiful Dorado Beach area which is a half hour drive from the Luis Munoz Marin Airport. The house is beautifully architected in the Spanish styling. It is a gated and guarded community and the guards walk around not only during the day but also at night. We felt very secure. The guards were also very friendly. There is one large master bedroom and two good sized bedrooms each with their own full bathroom. This was perfect for my family as it allowed everyone the privacy they needed and sufficient space to get ready for a night out or a walk to the beach. I enjoyed my early mornings on the patio with a cup of coffee and local pastry while I watched the sun rise and just spent quiet time reflecting. This is how a vacation should be. The patio of house is right in front of the pool where we spent time every day. A short walk down a path and through a keyed gate and you are on the beach. The beaches in the Condado and Isla Verde areas can be rough but the beach that is accessible from the house was much calmer. Having access to the Dorado Beach Hyatt facilities was also very nice as it is right next door to the housing complex. We also had time to use the properties tennis court which is nice and we were the only ones playing. There also is a ping pong table but we did not have time to use it. The dining room table is large and we had room to seat 12 people at it. My wife is from Puerto Rico and her family came over to celebrate a birthday with us so the space was convenient to accommodate all of us at one table. The kitchen came in handy as it not only allowed us to save money by preparing our own breakfast and occasional dinner but also allowed us to chat around the kitchen as we prepared our food. As for site seeing, most tourist locations are a short drive away. We were able to visit the Caverns of Camuy, the Arecibo Observatory, the Morro, Old San Juan all of which are within 30 minutes or less from the house. We had a terrific stay at your Lakeside Villa in Dorado, Puerto Rico. I have to say that we didn’t want to leave at all. We enjoyed the pool area, the access to the beach was just a few steps away, the back terrace was very spacious and it was perfect to spend quality family time and enjoy a nice conversation. If you want to spend quite and relaxing time, this is the place for it. There was no need to leave the villa to grab a bite. We came with groceries and prepared meals. There was plenty of space for everyone. We will definately come back again in the future if the villa is available. First of all – your beautiful, spacious, comfortable home. From the lovely terra cotta floors to the tile details to the generously stocked kitchen and refrigerator – it was wonderful. We came in thirsty and tired and immediately got refreshed and were off and running within an hour. It was so kind of you to let us have access to your supply closet. It was such a treat not to have to run out to the grocery immediately and be able to find a snack for everyone. We replenished it with great joy and thanks. Thirdly – the Villa itself – the wonderful porch; the fountain with the constant soothing sound of water; the pool; the pool house with ping pong; the putting green and gorgeous tennis courts – all used daily by the Raibley Bryden entourage. And all of this….and we were seemingly the only ones there – hardly ever saw anyone except the grounds people and security. What a great place – we LOVED it. Fourthly – Hector – what a gem of a person. He was waiting for us at the airport and took us to the Villa as well as a wonderful day in the rain forest. He was kind, caring and very willing to share his local knowledge and information with all of our curious guests. Thanks so much for putting us in contact with him. He loves you guys. He said he has never met such sweet, nice people. We all concurred. “Puerto Rico was great. Something to do for everyone. Walking on the beach in the warm rain. Shopping in Old San Juan. Great photo opts there , too. The architecture with it’s beautiful tilework and balconies is wonderful! The trip to the rain forest was a favorite of us all (we have 3 boys and they are still talking about it! Look for the giant snails on the trees). Finding the waterfall was an added treat and a must do (bring water shoes if you have sensitive feet like me). Another wonderful thing to do is to take a catamaran / snorkeling trip. The name of the group we went with was East Winds. The boat was clean and the food was delicious. Lots of interesting and colorful fish that we have never seen before. Afterwards we went to Loquillo Beach which was a great beach for the wave / surfer enthusiast. And of course, just staying on the beach at the villas was a great way to spend the day. Plus access to the Hyatt’s waterslide and lazy river (lined with tropical plants and palms) makes you feel you are somewhere very special. We all returned very tan and very relaxed. “Just wanted to let you know we’re back and we had a wonderful time. What a great place you have there! Beautiful and peaceful. We had great weather – only one rainy afternoon which still did not impede my husband and his brother’s golf outing. We loved the water park at the beginning and end of our week. We had a lovely walk through Old San Juan and El Morro. We took a snorkeling excursion to Culebra we enjoyed it so much that we turned it into an overnight visit. “Just a note to let you know we returned safely from Paradise on Tuesday. Thank you very much for your extended hospitality through the Nor’easter! It is hard to believe that the full moon shining on the sea is the same moon we see here! Your villa is beautiful – I love your furnishings, wall sconces, and great ceramics and glassware!